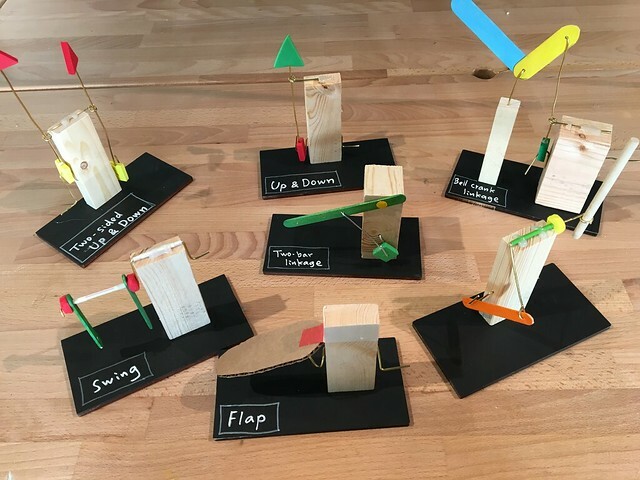 We have been prototyping a new automata activity called “Cranky Contraptions” using simple materials such as wooden blocks, wire, and foamies. Now that it’s been about a month that we have been testing the activity with the visitors, I wanted to take a moment to share about this new activity, how it all started, and what people have been making. 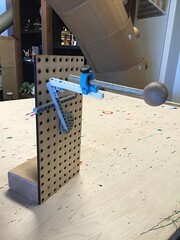 Cranky contraptions are a type of moving toys that utilize a 'crank slider' motion mechanism. They have a little crank handle and each of these samples in the photo creates a different motion when you crank it: some goes Up & Down, or side-to-side, some swings or flaps, and so on. You can see how each motion example works in the video below. For a long time, we have been making automata in the Tinkering Studio with many different materials. 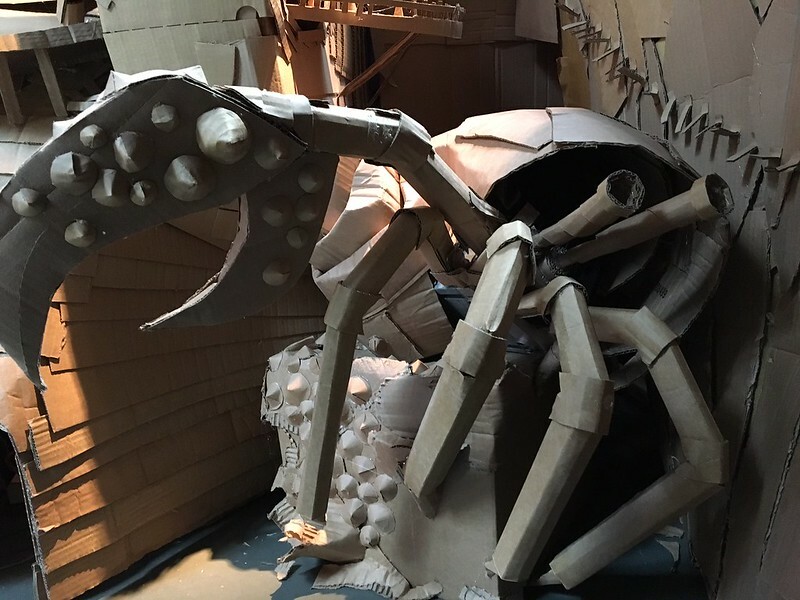 Using cardboard is our classic way of making automata, but we’ve also tried making one entirely from food, trash, wire, and wood. 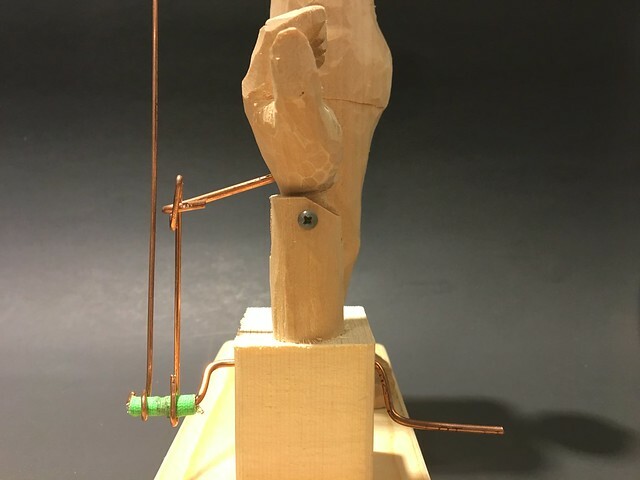 While we enjoy different materials for making automata, we have always considered how to shorten the time spent making the frame so that visitors can quickly get to the point where they can tinker with mechanisms and animate the sculpture. 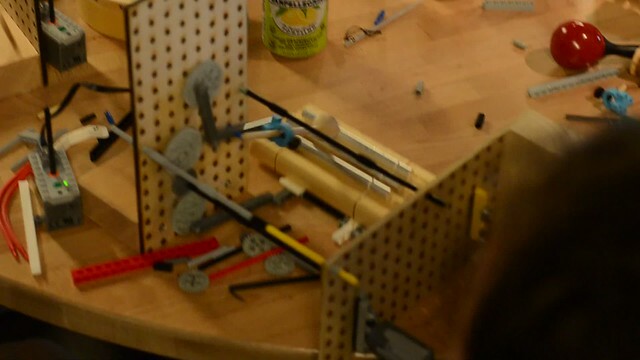 The first big hint came from a twitter feed: A clothespin automata! 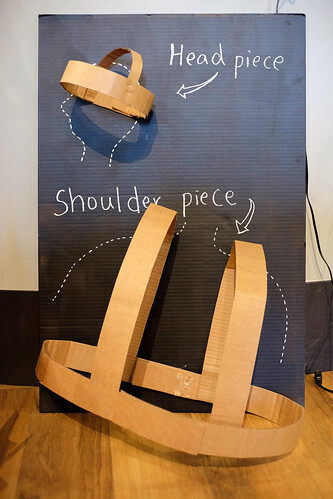 This gave us the idea to use a familiar object, such as a clothespin, as a frame for the mechanism so people can quickly start making the animated sculpture. 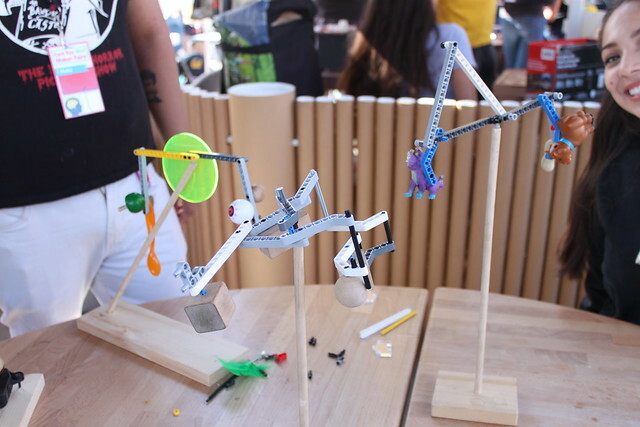 We also liked that it lets people experiment with lever and linkage-based mechanisms which have more possibilities than the spinning cams or the up & down cams that people use in cardboard automata. 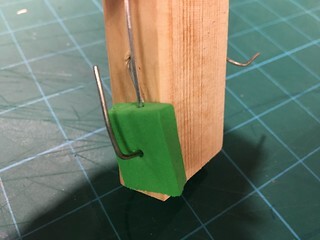 However, after trying it out for a couple of days in the Tinkering Studio, we found that it was not so easy especially for children to bend wire precisely around such tiny clothespins. The scale needed to be larger. Also, using clothespins without taking advantage of their open/closing function was counter intuitive for people to understand what this was about. Another big hint came from Carlos Zapata’s automata. He is an artist in residence and spent two weeks with us during the Curious Contraption show. He was using a 1x1 wooden block with a hole as a frame to build the crank mechanism. We liked the size, it looked much more manageable especially for young children. The day after we saw this, we started using wooden blocks instead of clothespins. This was an improvement, but we still had a problem(?) to solve. We were looping the end of the wire around the crank to joint with the vertical rod: most children found this too difficult to do. The next big hint came from another artist in residence, Hernán Lira. 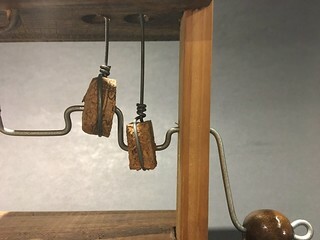 He threaded a piece of cork on the crank shaft loosely enough that it could spin, and then tied the vertical rod to the cork. The simple solution inspired us to experiment with the substitution for the cork. We tried it with a piece of foamie (just because it was around) and simply poked the wire into the foam. It worked. Thanks to those two breakthrough, we were able to lower the threshold of this activity. 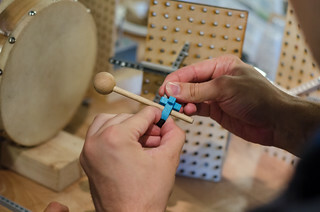 Providing a wooden block as a frame made it much quicker for people to get started, and the technique of using a piece of foamie for the crank slider joint made it easier for people to get to the point where they can tinker with the motion mechanism. As a result, they spend longer time working on the mechanism (very short time on making the frame), and they focus more on tweaking the motion mechanism to animate the sculptures. 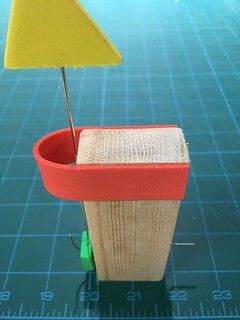 The last thing to figure out was how to make a guide that goes on top of the block to hold the vertical rod. For that, we have been experimenting with three different ways of making the guide: wire, popsicle stick, and thin foamie strip. They all do the same job: to hold the vertical wire straight up. For the popsicle stick one (photo in the middle), we provide a good hole punch "Crop-A-Dile" so people can make a clean hole without breaking the popsicle stick. The thin foamie strip (photo on the right) would be good if you are working with young children. 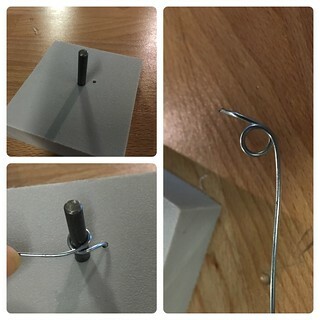 Making a wire loop with a plier is a little bit tricky (photo on the left), but we've created a "loop making jig" so the job can be done in a few seconds. 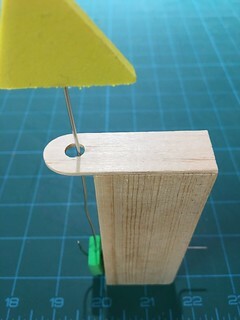 Loop making jig: Put the wire end in the tiny hole and wrap the wire around the rod. Take it out. You got a loop! And here is our short instruction video about how to make the most basic Cranky Contraption mechanism. It's been a month since we started this activity on the floor. 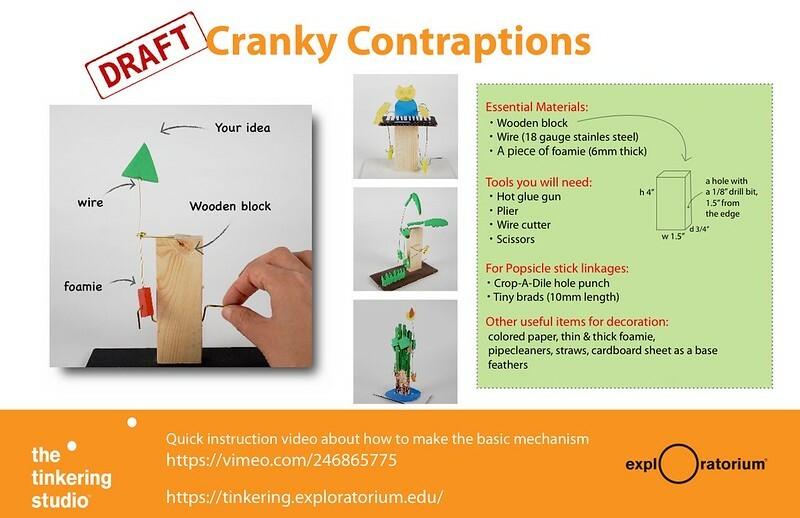 The video below is showing the varieties of Cranky Contraptions that visitors to the Tinkering Studio made so far. 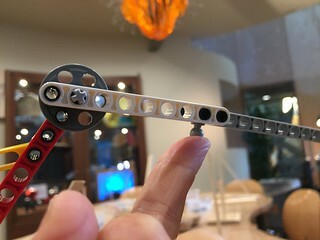 It is amazing to see so many different motion mechanisms that a crank slider mechanism can produce. We are also really impressed to see the personal expressions and narrative elements that people pour in their contraptions. All in all, what excites me the most is that people spend more time on figuring out how the mechanism works, tweaking the motion, animating their own sculpture, and very little time on making the frame. Here is a little handout that we have created so you can try it out in your own educational setting. As I said, this activity is still on our prototyping stage (so it is a "draft"), and I'm looking forward to further development. We are interested to hear your feedback about this new idea, and we are so excited and curious to see where you take this idea! Another cardboard activity along the side of the Large scale & Small scale stop motion animations in the event of Infinite Versatility of Cardboard was Making Cardboard Costumes. This time, we set up our favorite “Tinkering photo frame” for people to capture their cardboard costumes, and to take this photo booth experience online, we also set up a hashtag #cardboardtinkering and used a social media wall "Walls.io" so that we could collect all the pictures with the hashtag and display them as a live-updating photo album on the large monitor during the event. 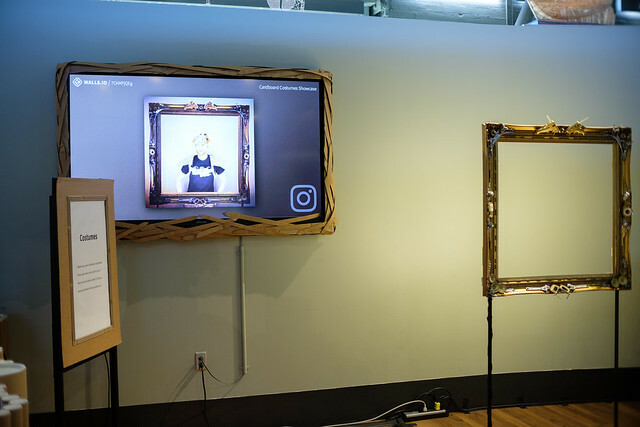 This photo booth and live-updating photo wall was a great addition to the costume activity. I thought it was great to have a designated spot for people to take photos after all the hard work(!) of creating costumes, and also to see the photos instantly on the big monitor felt like a treat. 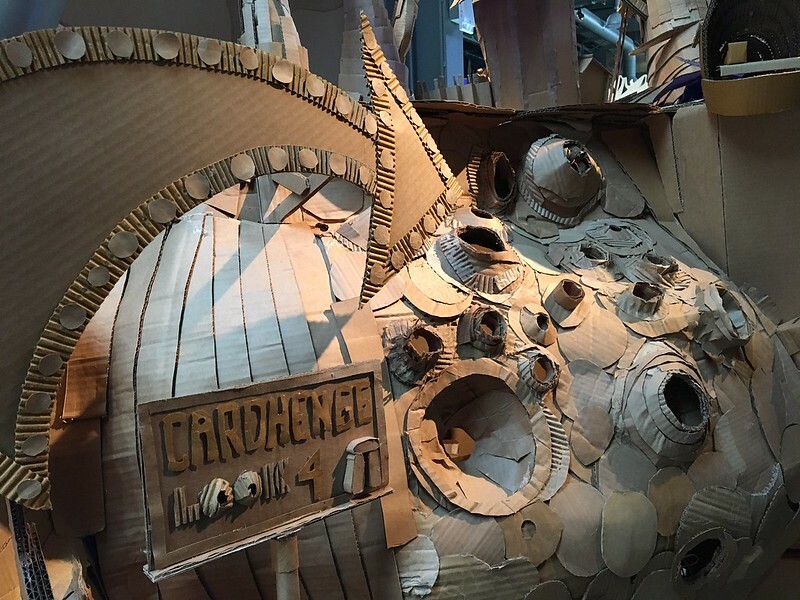 You can check out the social media wall created on the event day here #cardboardtinkering! For the activity itself, we prepared a wide range of examples from a very simple hat to an elaborate outfit and displayed them throughout the space. 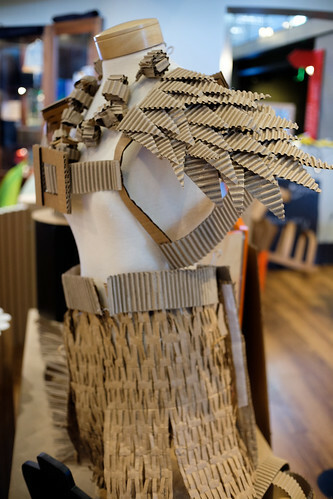 To feed the appetite for people’s creativity, showing the wide range of the cardboard costume examples, from a low threshold to a high ceiling, was really important. The visual board to show a starting point of how to make a simple head piece and shoulder piece worked as a good introduction and helped people to get started. We also had a board showing some decoration techniques. Not sure how much those examples and the visual boards helped, but overall we were surprised at the level of creativity of people who made a variety of headpieces with intricate decoration, a cardboard backpack, a handbag, shoes with wings, a lion mask, a Hawaiian hula girl skirt, etc… People came up with their own designs, and there was plenty of surprise, joy, and pride! A lot of people walked out wearing their newly made costumes. I really enjoyed seeing the variety of outcomes. Overall we had a great day making costumes. The photo booth and the social media wall was such a fun addition that we'd like to try more with different activities in the future. 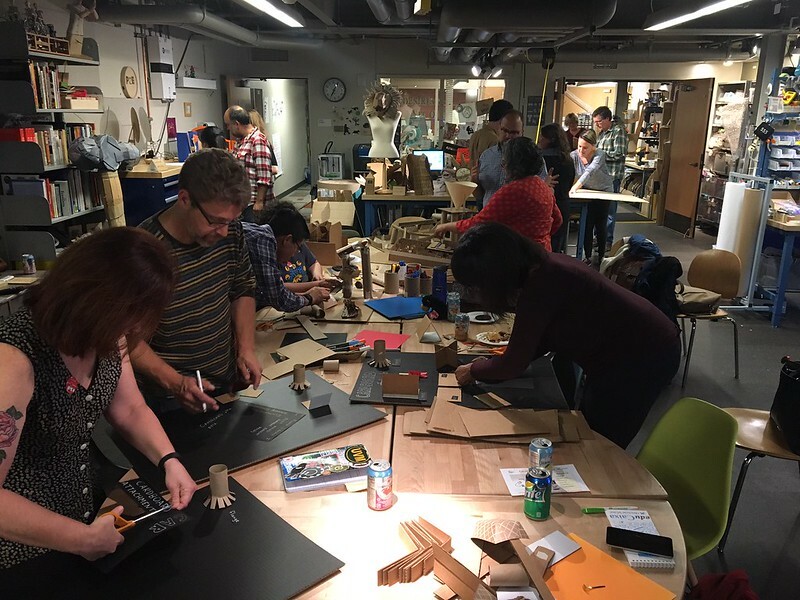 Last Thursday we hosted BAME (Bay Area Maker Educators) meet-up with the theme Cardboard. We love exploring familiar materials and finding new ways to tinker with them. 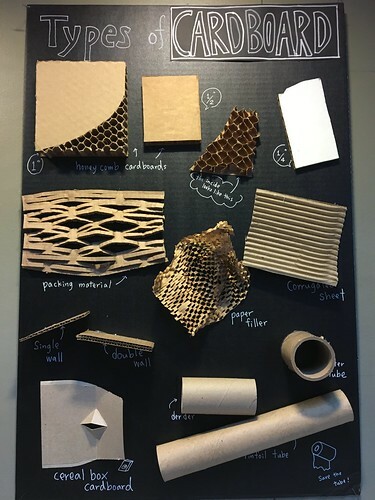 Cardboard is definitely one of the materials that we’ve been using a lot in our daily prototypes as well as in the tinkering projects. 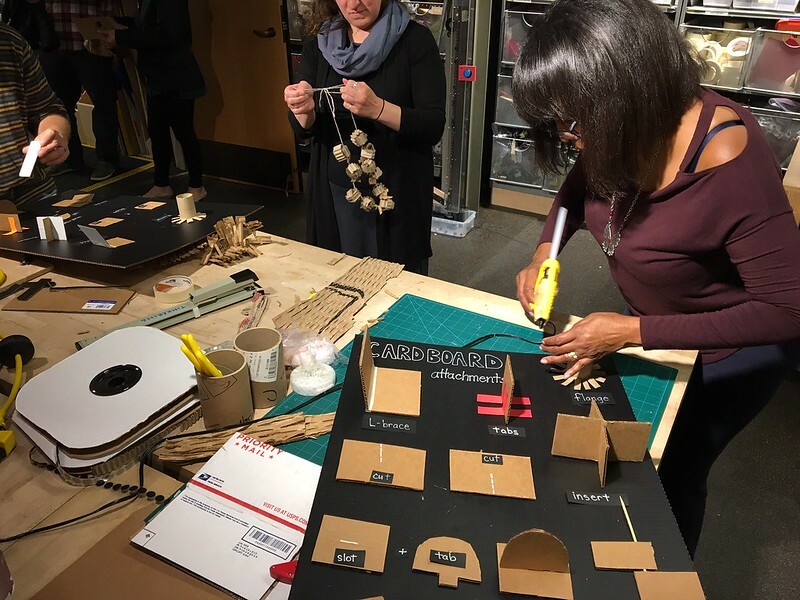 Since the Exploratorium’s new exhibition WildCard is coming up soon, it seemed to be a good time for us and other maker educators to get together around the topic of cardboard and share out what we can do with cardboard in terms of tinkering in our museums and classrooms settings. We started off the meeting by showing a video from OpenMake Cardboard event that we hosted a few years ago. It was a good introduction to overview what cardboard activities we’ve done in the past and who are the artists we’ve been working with. We also showed a couple of other projects that we've tried such as Cardboard pop-up tree and large scale stop motion animations. 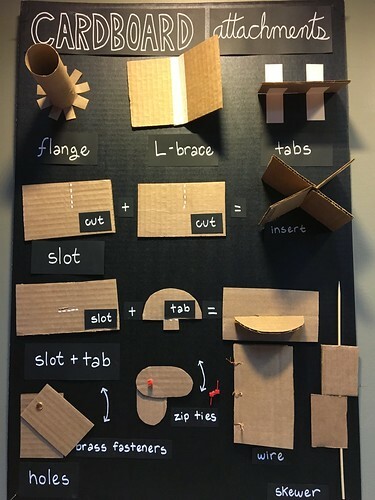 The board idea to show different cardboard attachment methods originally came from Sarah Wyman, an art teacher at Festus Elementary School, and Deanna recreated this board with a few additions. 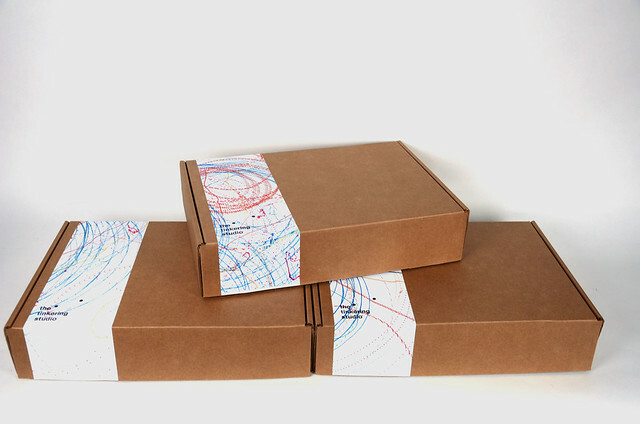 We also created "Types of Cardboard" to show different kinds of cardboard. 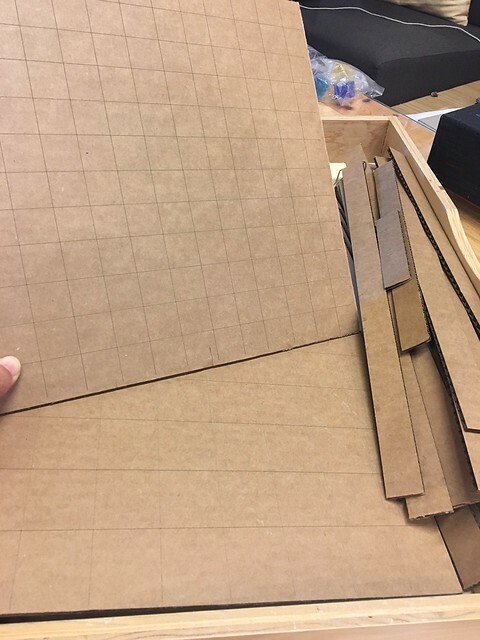 Since they both work as a good reference for cardboard construction projects (especially the attachment technique board has been embraced by STEAM educators over and over on the social media), we prepared extra boards and materials so that the participants can create their own for their classroom or maker space. And yes, people were busy making their own! It was great that they could learn a few attachment techniques while building a visual board for students. 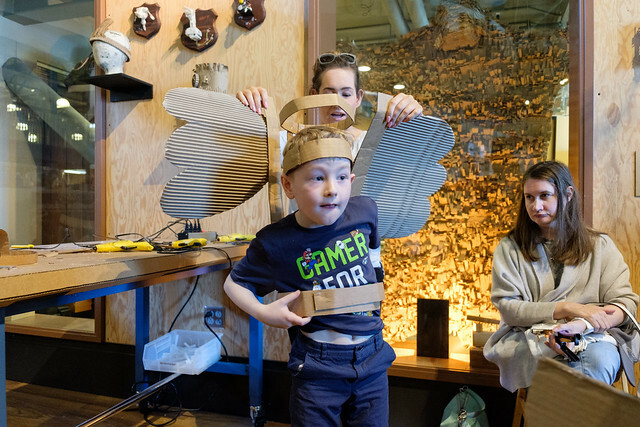 Cardboard automata is our long-time favorite activity. 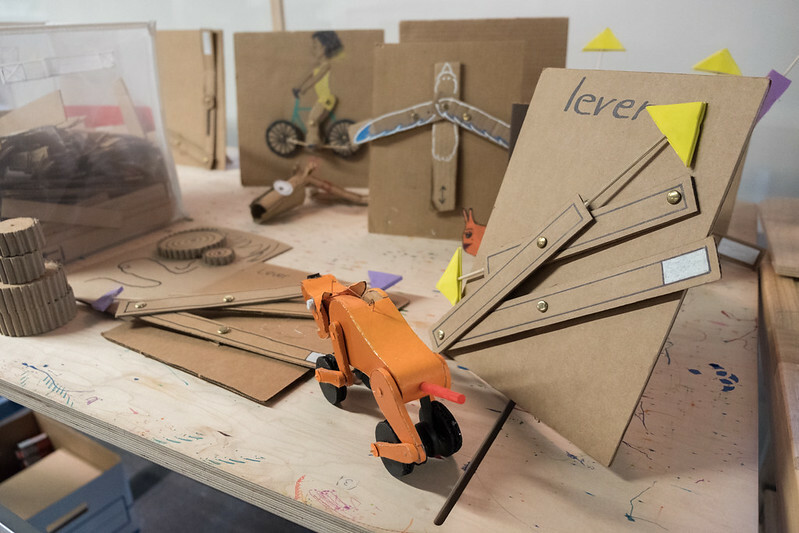 We love that simple materials such as cardboard and foamies can create a mechanical sculpture and let you explore machine elements such as cams and levers in a playful way. On the table, we spread a few basic motion examples to help people observe the mechanisms. We had an impression that many people are already familiar with this activity, but it's always good to revisit the same activity: you will always find something new. 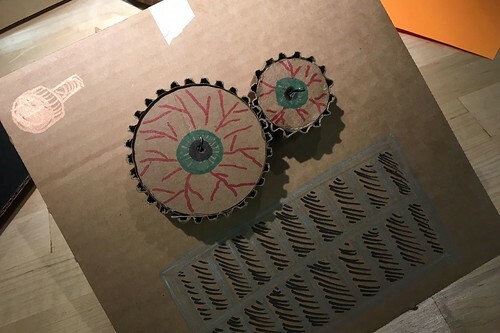 We also informed people that the new online Tinkering Fundamentals course that we are hosting on Coursera (Mike, Karen, and Luigi are the instructor) is about motion and mechanisms, and the cardboard automata activity will be featured in that course. It's starting at the end of July. Inspired by Noga Elhassid, an artist from Israeli, we have been developing the activity and accumulated many examples of motion mechanisms and art pieces. 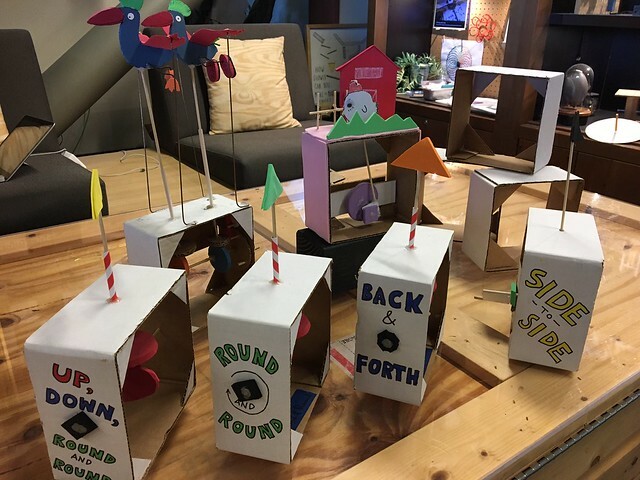 To help our participants to get started, just like the cardboard automata, we had a few examples of very basic motions that we spread around the table. 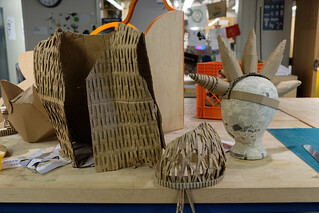 Cardboard corrugated gears are something we've been prototyping with but not being so sure what we could make out of those. I'm delighted to find that this rolling eyeballs were made in the night. - Or-ita: Cardboad scoring tool :An amazing cardboard scoring tool with a custom handmade blade by a Japanese artist, Makoto Orisaki. - Titanium Snip Scissors :Great shears! 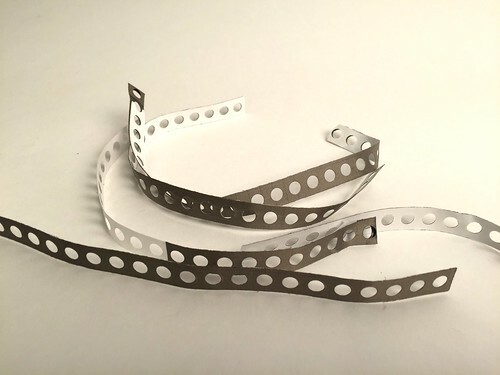 Not only cardboard, this can cut many other materials such as chip board, thin aluminum, canvas, and plastic sheet. - Klever kutter :Very safe cutter for cardboard. Great for classroom uses. - Canary Corrugated Cardboard cutter :Different from Klever Kutter, this works more like a cardboard saw. It cuts with a back and forth motion. Feels like a knife through butter! - Milwaukee Filip Knife :Our all time favorite! 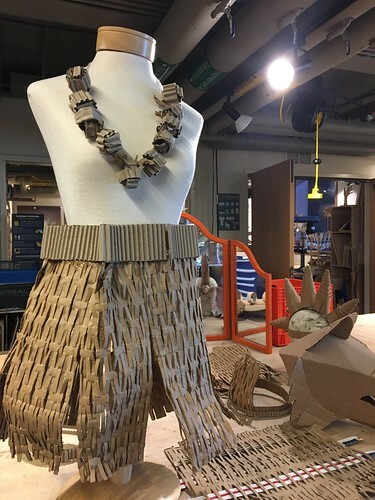 Our new high school project explainer intern MaryClare created this skirt with the cardboard packing materials. The necklace was made by Donna, a participant from east coast who happened to be in town that night! The guests seemed to be fine with a freestyle building, but in the future, I would provide more obvious starting points to help people get started: it could be these simple head/shoulder bases. Also, I'd like to come up with a simple base model for creating various masks. 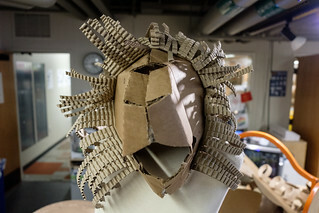 For example, I've made a mask of wolf by downloading a template from here (It's actually for construction paper, not for cardboard) and made a modified lion mask based on that. It was not easy. But I know a lot of people want to make cool masks! It would be fun if we could come up with a simple base and people could make various masks from that. Also, having a photo booth like this might be a good addition to encourage people to create costumes and document themselves for future events! 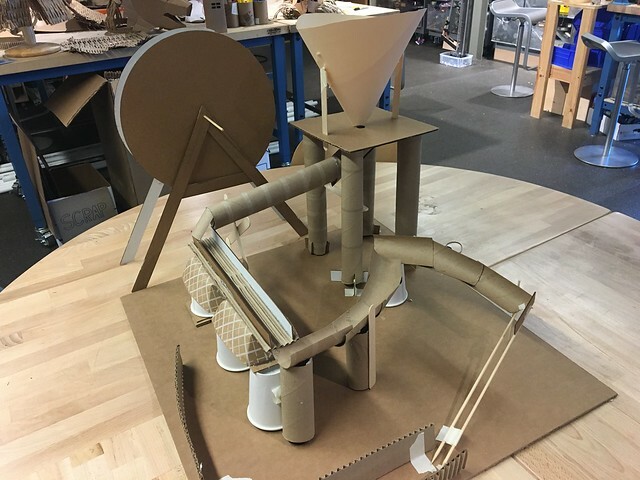 Usually we build marble machines with peg boards and dowels, but you can also build one with cardboard. In fact, cardboard is more accessible and easier to manipulate! Deanna created this example, and I like that she used masking tape instead of hotglue: it allows people to adjust the positions of the tracks after building. The big circle was her attempt to create a marble wheel to pick up marble balls, which was still work in progress. 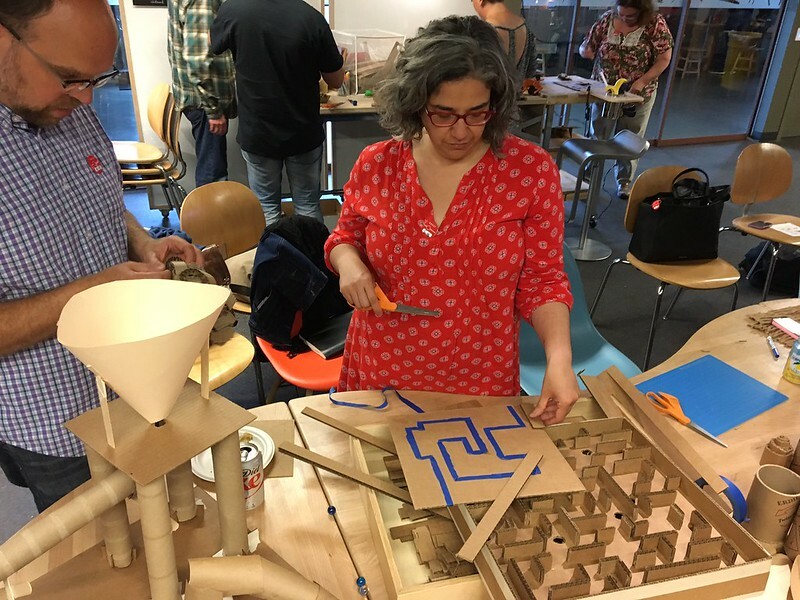 The educators from Lawrence Hall of Science Ingenuity Lab created their own marble run! Here is a Tweet from them. 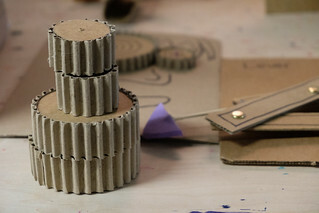 This was an attempt to show that a simple coin acceptor can be made out of cardboard. For this particular example, we used Tim Hunkin's coin acceptor template, a low torque switch (we used this one from Adafruit), and Noga's linkage boat which was hooked up with a servo motor and arduino. When you insert a coin, it falls on a whisker trigger and activates the servo motor to sweep the oar back and forth. 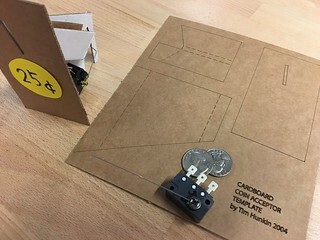 We printed Tim Hunkin's template on several cardboard sheets so people could take home and make their own coin-operated 'something', it could be a light, motor, or any arduino project. 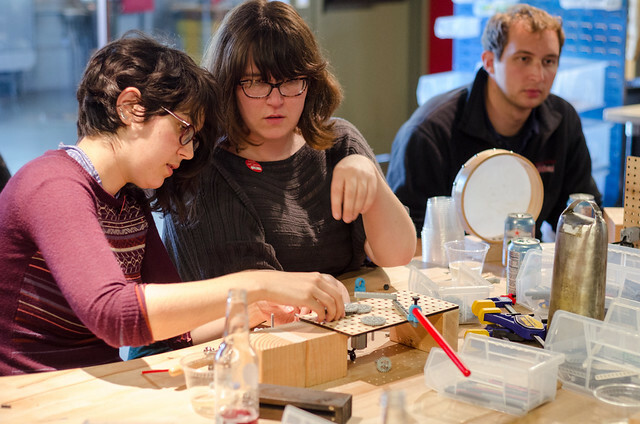 Although she was not the participant of BAME meetup, Susan, who visited us in the week of BAME, made her own coin operated LED with our template! 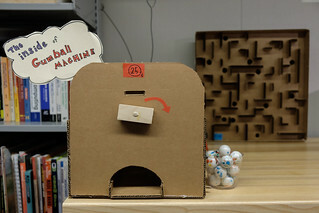 This was another attempt to make a coin operated mechanism out of cardboard. Being inspired by this example on youtube, I followed the instruction halfway through but decided not to cover the mechanism. Leaving the top open so that people could see how it works inside seemed to be more appropriate for the BAME meet-up. This was not meant to be an activity, but guests were encouraged to interact with the machine - drop a quarter coin, load gumballs, drop wrong kind of coins and see what happens, turn the handle in the opposite direction...etc. 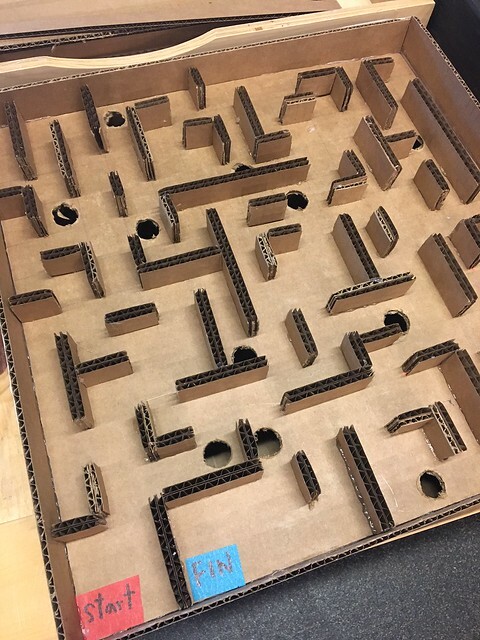 Okay, you can't really build a coin operated machine within the short amount of activity time during the BAME meet-up, but how about building a cardboard marble maze? It's a sort of marble machines and you design the marble path. I've made one example and found that it was helpful to have grid lines on the board (so it can be used as a guide for placing internal walls) and lots of pre-cut strips available at hand. We prepared a lot of cardboard strips and printed subtle grid lines with two different patterns on both sides of the cardboard sheets. Danielle drew a marble path with blue masking tape first, then she started building the internal wall pieces, making sure that they would not block the path that she designed. Using masking tape instead of pencils was a good idea because you can just peel it after building the maze, leaving no trace! There were also some people who didn't use any of these grid lines and created their own marble mazes from blank cardboard sheets (sorry, no picture). 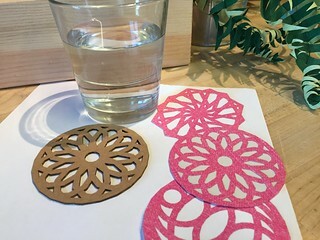 I was also trying to find a good way to make circle holes on the cardboard sheet. For that night, we used a 3/4" diameter hole saw, but I found that the hole saw tends to scrape the back of the cardboard sheet when it comes through, so I used the hole saw to cut only halfway through and did the rest with a Xact knife. I'd say that this was still much easier way to make circle holes than cutting out entire holes with only a knife. 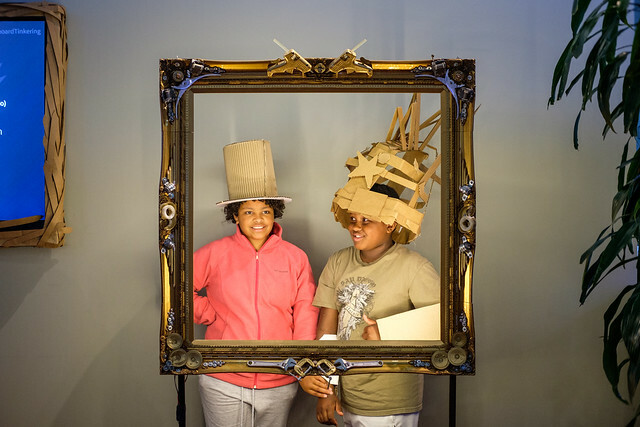 For the last 15 mins, we invited the guests to a sneak preview of the WildCard exhibition, where the members of Cardboard Institute of Technology (C.I.T) have been creating immersive cardboard environments in the Exploratorium's West Gallery. It was great the we had Allison as a participant that night, who had been coordinating this exhibit with C.I.T., and she took us to a journey through this immersive cardboard dreamscape! It felt like an interesting transition in terms of scale. 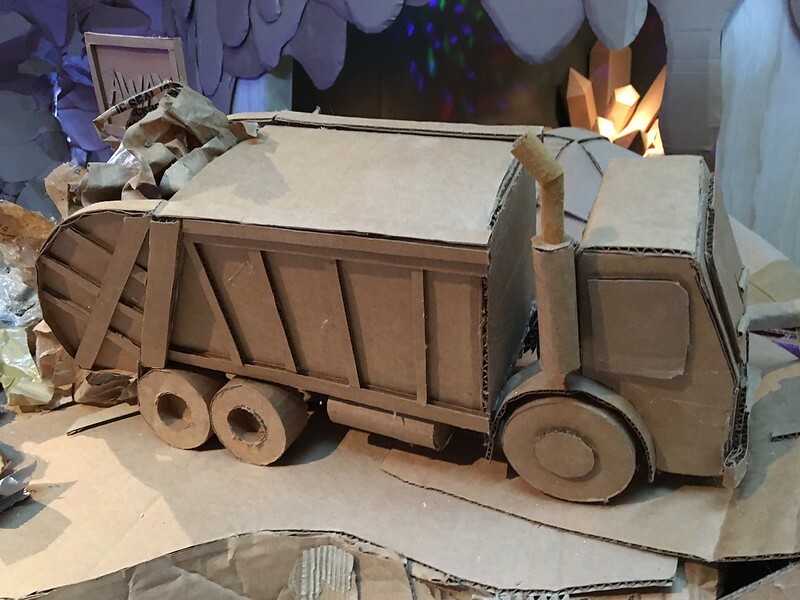 While walking through this large scale environment of cardboard, we also encouraged people to look closely to find their favorite pieces: I personally loved this garbage truck (reminded me of my son's obsession). We were allowed to take lots of photos. I'm sure each one of us got really good inspiration for a next cardboard project! All in all, I think the night was a success! 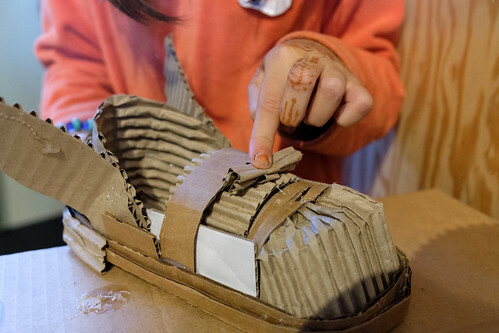 'Cardboard' in the context of tinkering & making is such a broad topic, but I think we were able to cover a wide range of cardboard projects. It was great that we had prepared several activity stations and the guests could choose which one to dive into. Some people were floating around from one activity to another, trying a little bit of everything. It was also good that there were connections to the works of the artists that we respect, because that's where we often get inspirations and come up with a new idea for the tinkering activities. We really enjoyed the event including the preparation process. I recognized, once again, that cardboard is a great material! 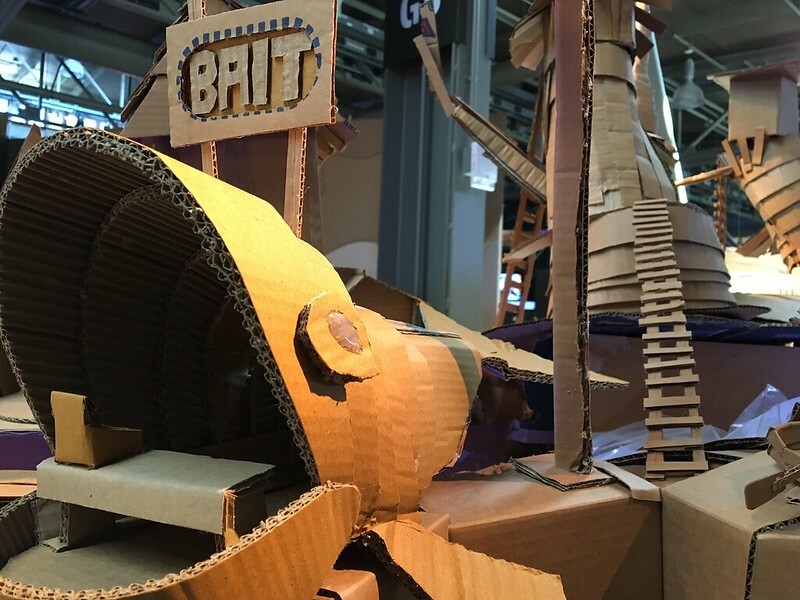 It is such an accessible material and easy to work with but also has lots of possibilities: your cardboard creation could go incredibly big like C.I.T's landscape, or it could be a small mechanism that you feel proud of. It could be a meticulous sculpture or costume with all kinds of building techniques. 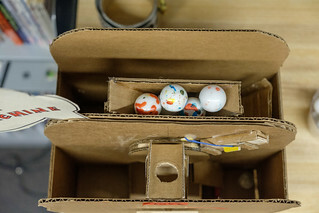 Or, you could add some other fun stuff to your cardboard projects, such as a motor, light, switch, arduino, etc.. Cardboard can always surprise people! 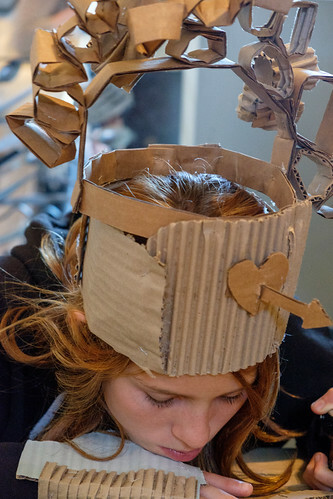 Here in the Tinkering Studio, we have lots of cardboard creations displayed, some are even in use, such as a cardboard bear rug, a cardboard tentacle, a cardboard girl, cardboard tube walls, automata, linkages, a giant hammer and plier, and and I like hearing people say "Look! That is made of cardboard!" 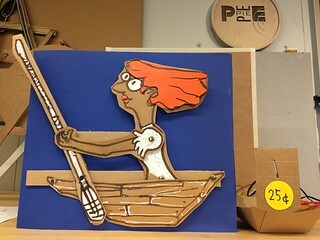 I am so excited with doing more cardboard projects. 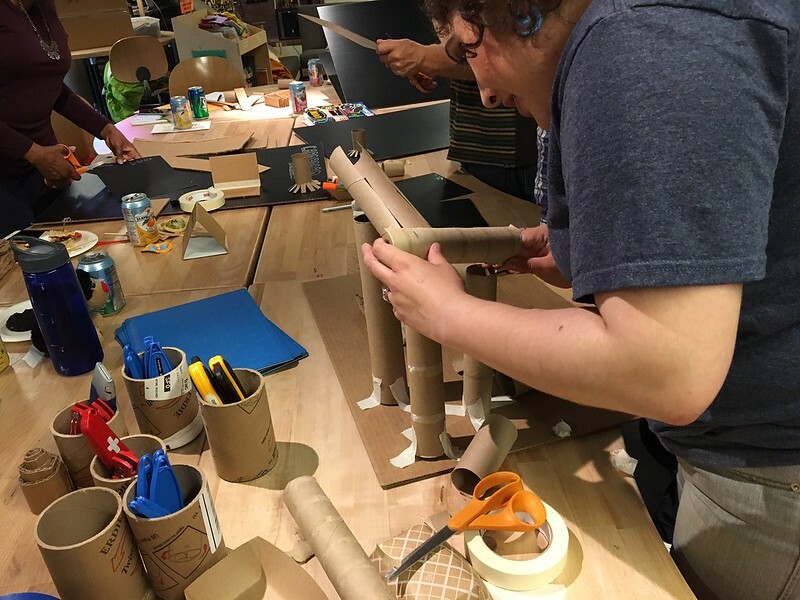 This summer we will host a couple of events "Infinite Versatility of Cardboard" and will immerse ourselves in the world of cardboard! We'll keep posting what we try next! 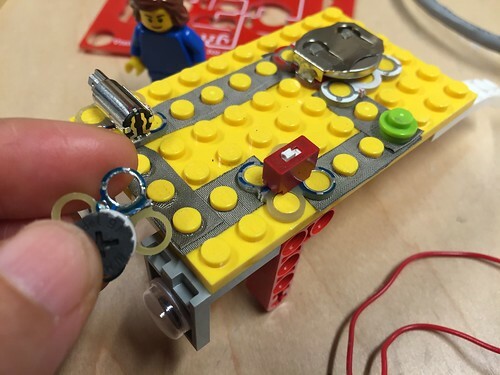 We've been prototyping LEGO Art Machines in the Tinkering Studio, and along the way we've learned a lot about which LEGO parts to put out on the floor and how to better support explorations on making Art Machines. 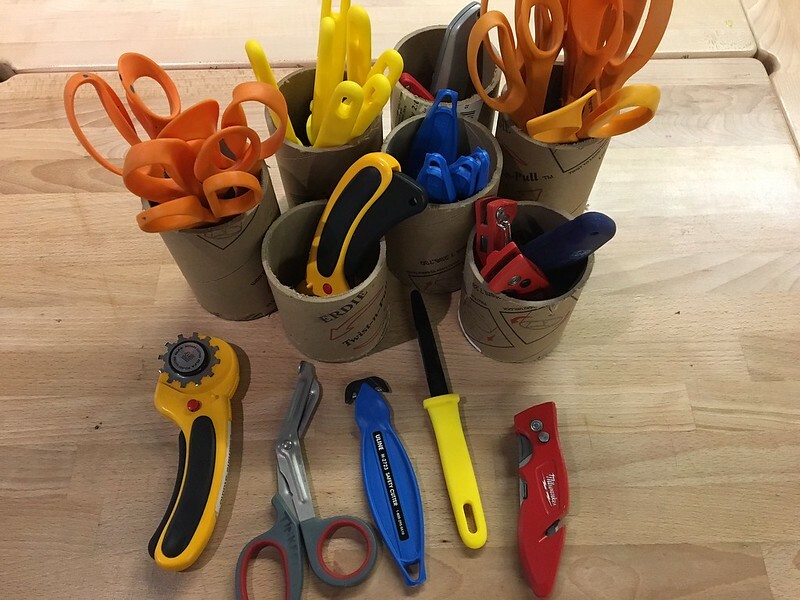 We shared our R & D process on this blog and through Twitter, which encouraged and inspired other educators to try the activity on their own by collecting parts and 3D printing pen holders to test in their own environments. This informal group of collaborators has been sharing their ideas through twitter and other social media through #LEGOtinkering. We've been inspired by what people have tried and incorporated their ideas into our development process. To take the prototyping process further and expand the group of testers, we assembled a small number of kits of parts and distributed them to a wider group of collaborators so they could also try this activity and help us take the idea further. It was important for us to send the kits to different kinds of spaces – museums, schools, libraries – so that the activity could be tested in different environments with different audiences and different cultures. The kits are arriving in their new homes, and people are beginning to share their experiments on social media. 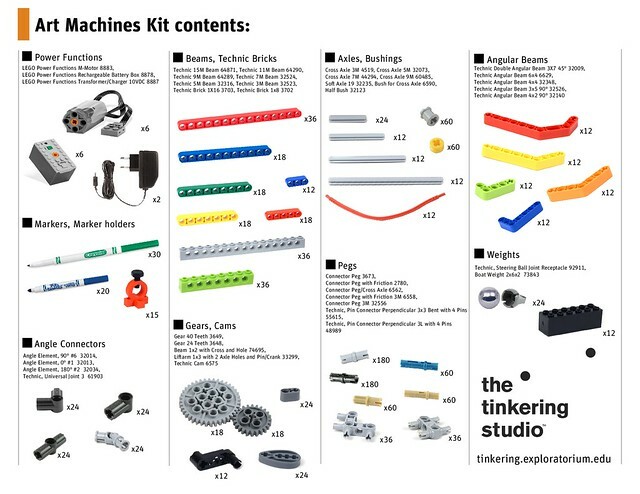 We've also started hearing lots more interest in LEGO Art Machines as people become curious about these kits! 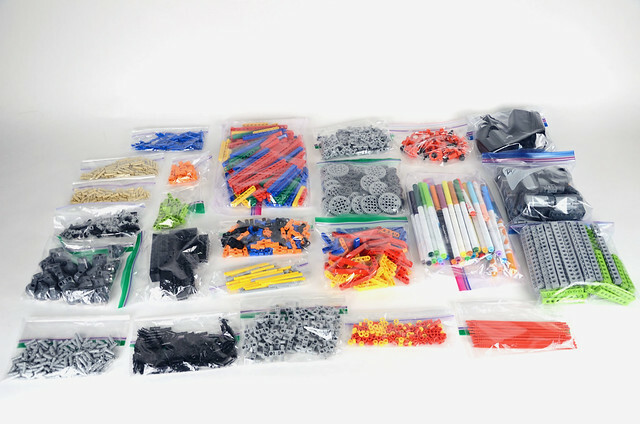 We thought it might be a good time to share some information about the kits and extend an invitation to everyone to gather their own materials and test the activity with us. 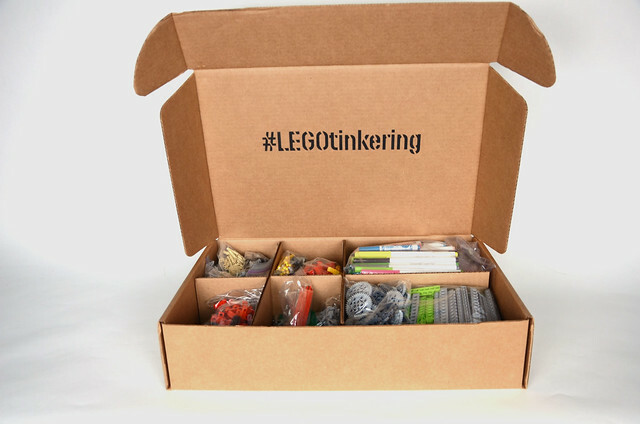 If you do, you can use #LEGOtinkering to share your thoughts and what you try. This is a PDF file that shows the contents as well as the quantities and parts numbers in the kit. Click it so you can download. We've also included this PDF which shows some base models that are helpful to get people started. Each of the "Base Models 1, 2 and 3" shows a different motion example: Off-set weight, Linkages, and Propulsion. We think of these models just as suggestions and inspirations for learners to take the ideas further, so please remix, iterate, and complexify them in your own way! And this is the actual contents in the box! The kit was designed for 6 people to explore the Art Machines. 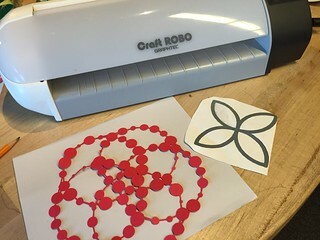 We were only able to send out a few kit to test this idea, but we've made other resources so more people can try making art machines on their own. 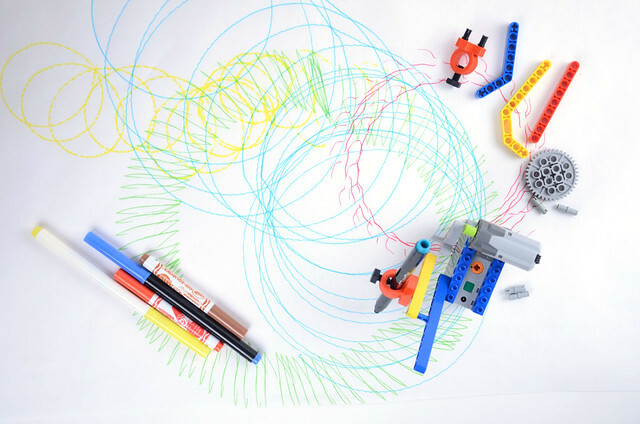 Check out our Instructables Tinkering with LEGO: Art Machines, the parts list and the blog posts, LEGO Pen Holder Evolution, LEGO Art Machines, and LEGO Art Machines with the TS Team. 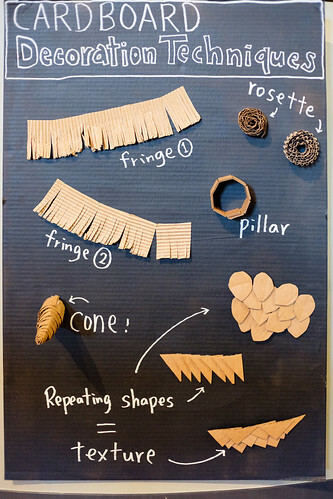 We hope you will try this activity in your class, at your museum or on your kitchen table. If you do, please share what you make! You can tag photos and videos of your experiments #LEGOtinkering if you want to share them with us through Twitter or Instagram, and be part of the prototyping process. These kits are an experiment (just like using twitter for R & D) to test the idea of developing an activity remotely and collaboratively. We are interested to hear your feedback about this new idea, and we are so excited and curious to see what you try with the parts and how this remote collaboration will take shape! Trying balance activities at East Bay Mini Maker Faire! 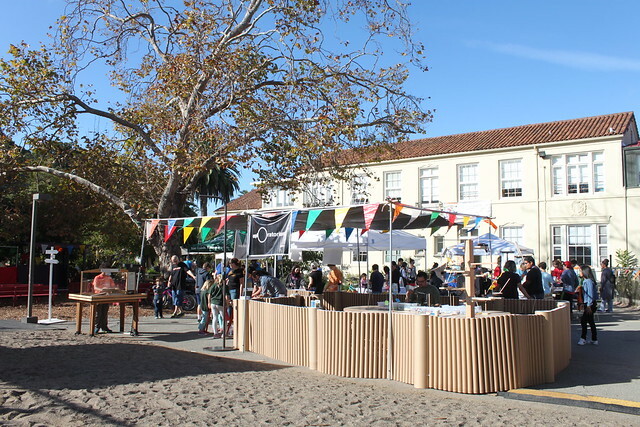 Last weekend, we participated in the 7th East Bay Mini Maker Faire at the beautiful campus of Park Day School in Oakland. 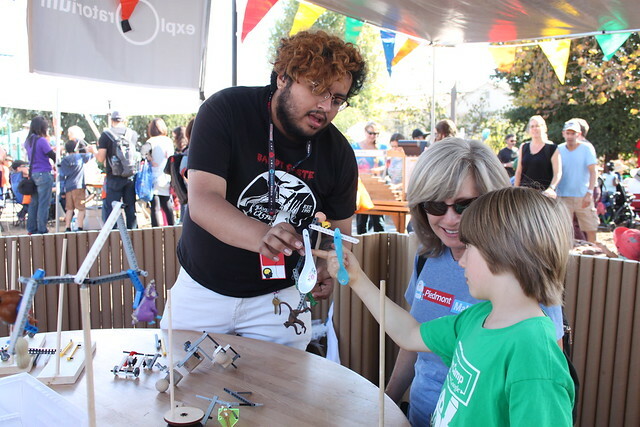 It is our second time and we love this event because it is a small fair (compared to the big Maker Faire in San Mateo) with only 170+ makers but still shows a variety of creative projects including carpentry, DIY science and technology, farming, and digital fabrication. Since we had just started prototyping LEGO balance activity, we thought it would be great to bring out the prototype activity and to experiment with the ideas of balance with local community outside the museum. We quickly packed up the materials from the floor along with a couple of exhibits and participated in the faire. 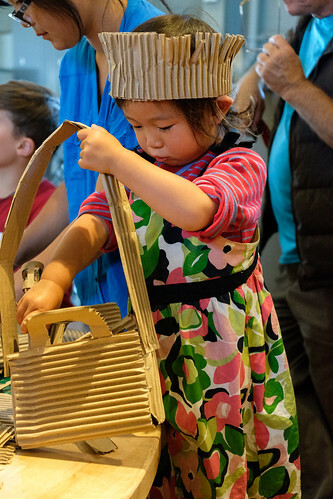 We were still at an early prototyping stage, so our R&D continued at the Mini Maker Faire. 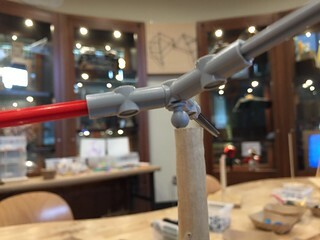 We knew that we would need some kind of starting points which would work as a basic structure that people could build onto, just like the three base models that we had for LEGO Art Machines, we wanted to provide the same kind of base structure for creating balance sculptures to help people get started with. We had come up with these two types of starting points, which are made of 1) a ball piece + beams, and 2) a ball + three way axles. We liked having a ball as an axis since it visually communicates people to build a sculpture that will be balanced on the ball. 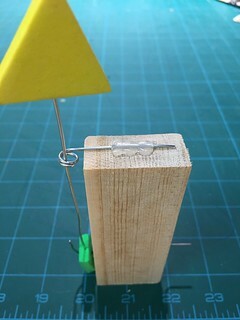 We started the activity by having visitors place the balancing examples on their finger so that they could feel the sculpture is balancing on a single point. This introduction seemed to work very well, visitors got the idea of the activity right away and started building their own sculptures. In terms of the activity design principle “Low floor, high ceiling, wide walls” we felt that this activity definitely provided the low floor, but in order to support the high ceiling and wide walls, we felt we needed to deliberatively show more surprising balancing examples to spark people's curiosities. 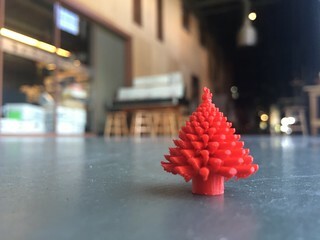 For the environment, we built a tree just one day before the event so that people could place their balancing sculptures to leave them there to inspire others. We added a slow moving motor on each branch so their balancing sculpture could slowly rotate while balancing on a stick. It was great to have the tree because it provided a stage for people to display their works. People looked excited that that they could add their sculptures to the tree and the tree became a collective display stand. Using slow moving motors also seemed to have impacted their feeling of accomplishment. 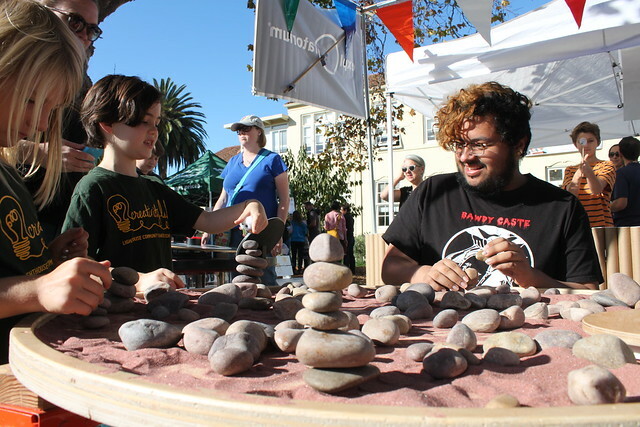 We meant this activity as a small quiet activity, but interestingly it turned out to be very popular, attracting all ages, the table was always surrounded by several people trying to stack rocks as many as possible. 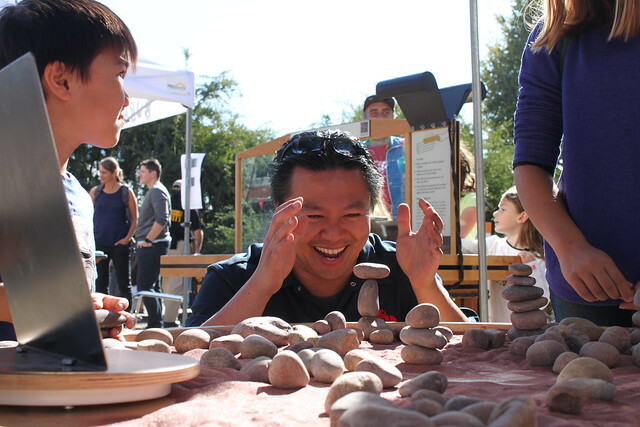 Rocks and sand, very simple materials, intuitive instruction (no need to explain what to do), and a social platform. It is worth while thinking the elements of this activity and why it was so popular. 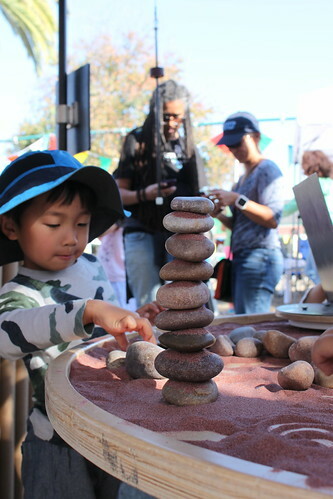 By the end of the day, people figured out that sprinkling sand prevents rocks from slipping and helps them stacking more... Our record of the day was 13 rocks stacked! 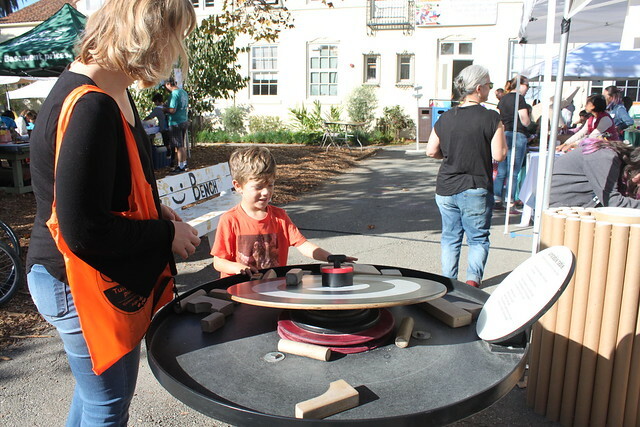 In the surrounding area, we placed a couple of exhibits from the Exploratorium with the theme of balance - Unstable table, Balancing Stick, and Take it from the Top. By having these exhibits around, we were hoping that visitors will get to experiment and iterate on the same scientific principle - balance- over and over with different scales, materials, and perspectives. 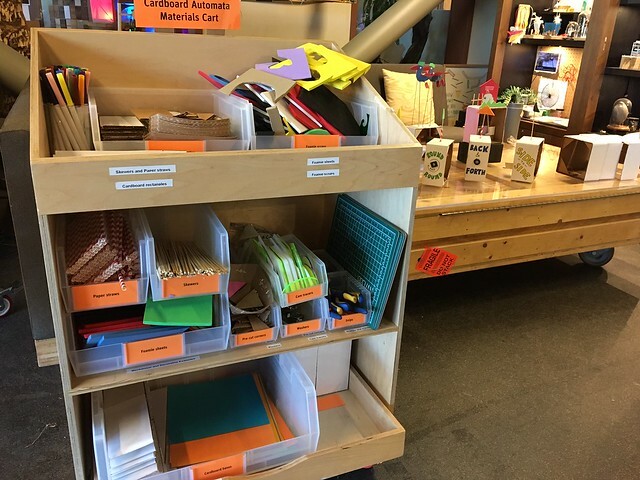 Logistically it was more work for us, but having various exhibits and activities with the same topic at different levels helped us to create a similar learning environment that we have in the Tinkering Studio. Bringing an activity to the Faire at such an early prototyping stage was a little bit of a challenge for us, but over all it was a great experience. We feel that having opportunities to test out when we develop new activities is an essential step in our R&D process. 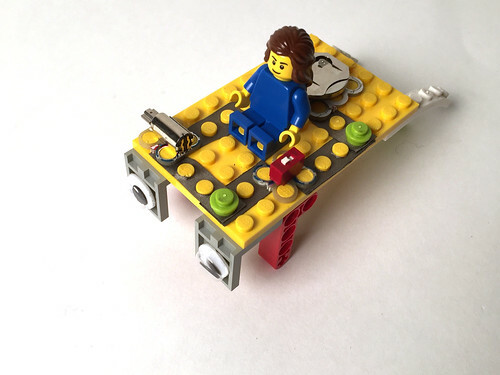 We are continuing LEGO balance prototyping on the floor this week. After the faire, we started trying creating more inspiring examples, revisiting starting points which would support high ceiling and wide walls, and in general we are exploring balance activities in many ways, which we will share in upcoming posts soon. Merge science, art and technology! Beetle Blocks is a visual programming environment for designing 3D objects. 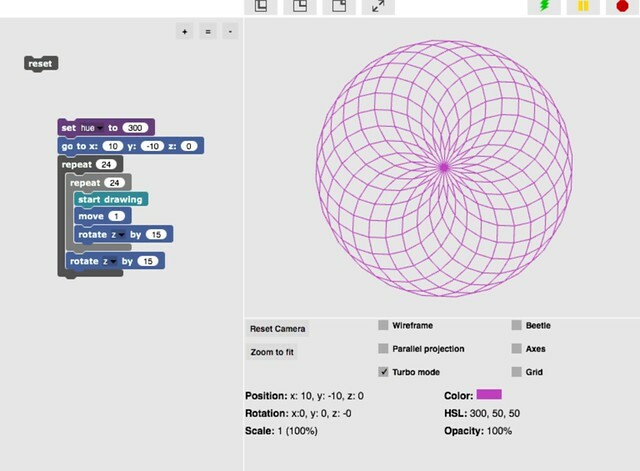 The interface is very similar to Scratch: you snap blocks of code that tell the computer what to draw and how to move in a 3d axes (x-y-z), and you can export the design to a 3D printer to create a physical 3D object. In the Tinkering Studio, because 3D printing often takes a long time and cannot serve for everyone in our drop-in style workshop, we have been exploring an alternative to 3D printer, and we've found that using Evil Mad Scientist's WaterColorBot as an output tool is our favorite since it takes only a few minutes to print out and at the same time it adds artistic elements to the project! It is quite interesting to see how the WaterColorBot interprets the Beetle Blocks code. All of sudden, the clean and systematic geometric shape on the computer screen becomes a unique art piece. 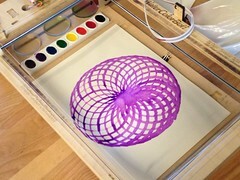 When the WaterColorBot executes a painting with the paintbrush, you see vivid and fluid color being drawn on the paper. Those colors sometimes bleed into one another, which is something you didn’t design on the computer. Because of this fluid nature of watercolor, the outcome always brings something unexpected but it often adds a nice surprise to your project. 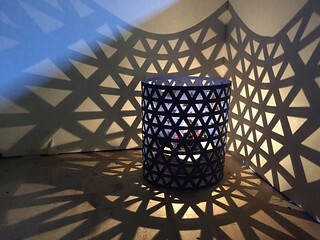 1) It is truly rewarding when you get an artistic geometric shape as a result of trial and error of coding. During the process, you are naturally exploring coding concepts such as loops, variables, and functions. Math and geometry are also involved here. 2) You kind of forget the fear of being “wrong” because your code usually doesn’t work the first time :-) That's the nature of coding, and it is totally ok not getting it right. Tinkering doesn’t start without failure, does it? 3) Because the coding process is iterative, you are naturally adopting a scientific method that is basically a cycle of making a hypothesis, doing experimentation, observing the result, and revising the code. 4) There is something interesting happens when your design gets transformed from digital (Beetle Blocks) to physical (WaterColorBot), suddenly you get your design existing as a concrete object that you can touch and feel. When you get an “object-to-think-with” in your hands, it accelerates tinkering. 5) It starts out with a block of code, which is very abstract and does not mean anything to you at first, but at some point the project turns into personally meaningful creations for you. It might be when you see your code draws a line, or when you get the first geometry shape, or when you see your design gets printed out. In any case, when you are working on something personally meaningful, you get especially motivated to make it work. 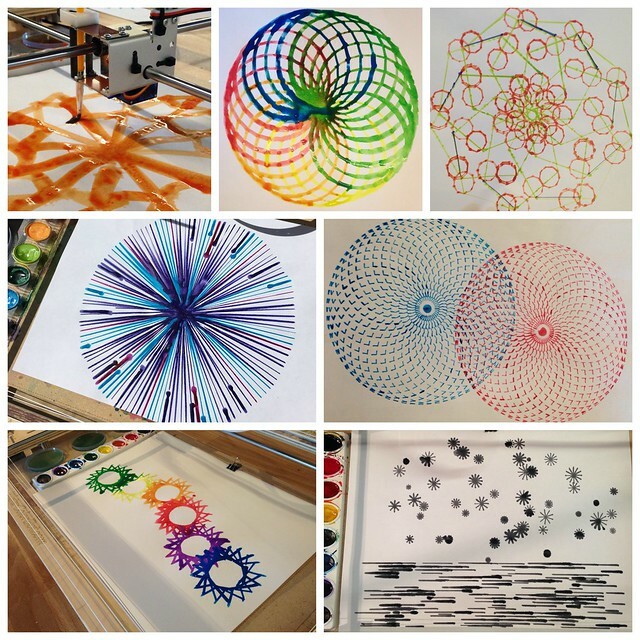 6) WaterColorBot always brings unexpectedness and whimsicality to your design. Here, getting the outcome does not become the end of your project. You feel you want to try more. Whether it is revising the code, tweaking the WaterColorBot setting, or replacing the brush, you are making a small but important adjustment for you. You find yourself in an eternal loop of iteration! 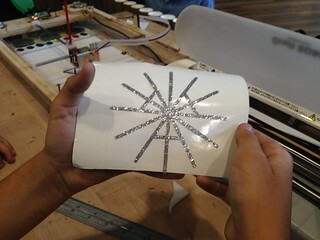 The possibilities with the Beetleblocks in the Tinkering Studio is not only limited with WaterColorBot. We’ve tried different tools and had fun to see a different outcome with each tool. 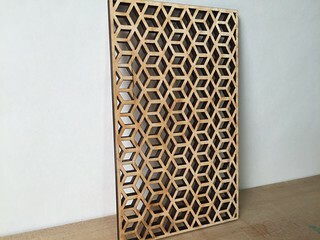 With Beetle Blocks, you can easily repeat a certain shape to make a beautiful geometric art which makes a great project for laser cutting. It is great to have lots of different materials such as paper, wood, plastics, or fabric to make different physical objects! Or how about making a sticker? Vinyl cutter cuts out the shape fairly quickly. 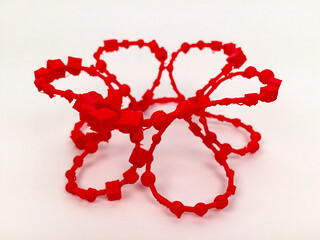 Lastly, this is what Beetle Blocks is originally for... 3D printing! Luigi made these projects. You can read about that here. 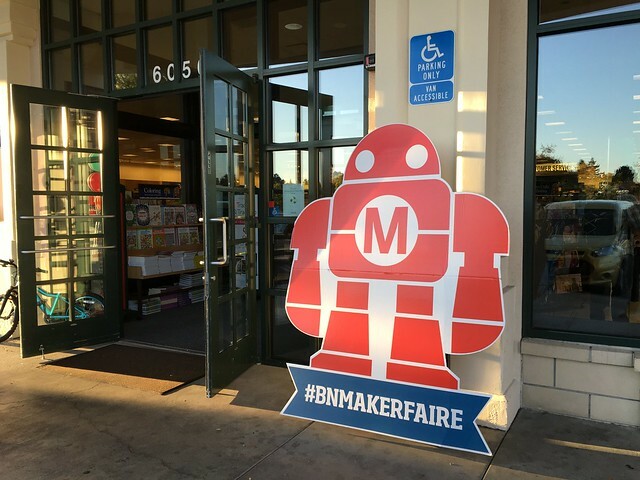 With the maker movement on the rise, there are more and more maker spaces equipped with digital fabrication tools like 3D printers and laser cutter. Turning a digital design into a physical object using those tools is fun, but the process of doing it is not always engaging. 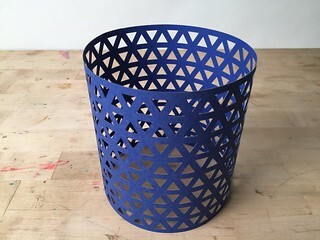 Some people simply download and print a ready-made design from an online repository like Thingiverse. We’ve found that combining Beetle Blocks with a digital tool makes a project very engaging. It is exciting to see that people going back and forth between digital and physical tools to pursue their personally meaningful creations. For us, just having fancy technologies doesn't mean a lot. We've found that those tools become powerful and meaningful only when people find a "right" reason to use them. So, try to set up a context so that the materials, tools (digital/analog) and outcomes all spark people’s curiosities and their motivation for making and tinkering! We often find the magic of tinkering happens at the intersection of art, science, and technology. 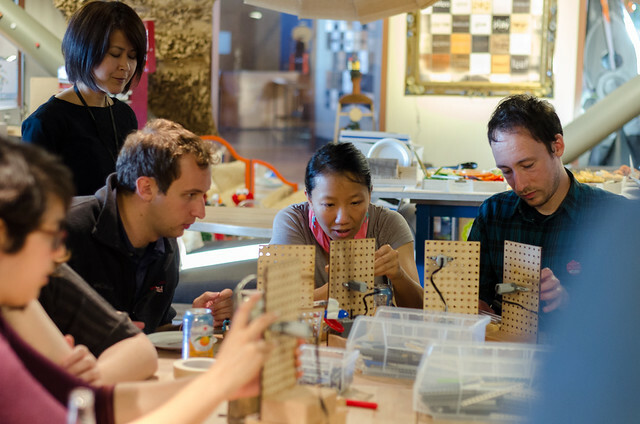 Last Thursday we had a meet-up for Bay Area Maker Educators (BAME) in the Learning Studio. 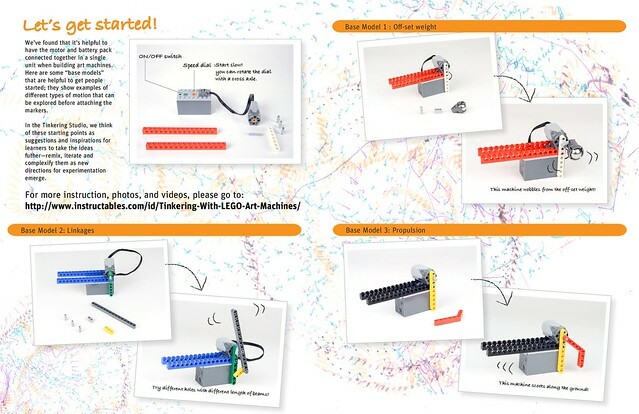 This time, we shared one of our new activities that we have been developing recently - Sound Machines with Lego linkages. It was the end of the school year and we were little bit worried about the attendance since a lot of schools were already going into summer mode, but thirteen maker educators participated in the event. After Lianna briefly introduced the idea of Sound machines, everyone dived into his/her own creation. I like seeing how quickly people get engaged in this activity. 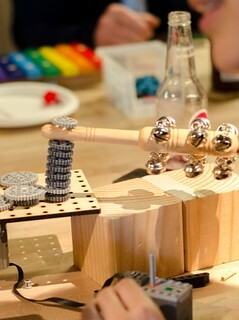 It was great to see how they used (or at least tried to use) the materials, music instruments, pegboards, and Lego parts. For example, just by looking at how people used the pegboard, we were convinced that our small pegboards communicated well that it could be used in versatile ways. 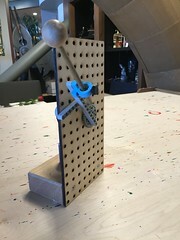 People used it sideways, facing up (or facing down to hang something), and there was also one group that connected two pegboards together to share a motion with one motor. 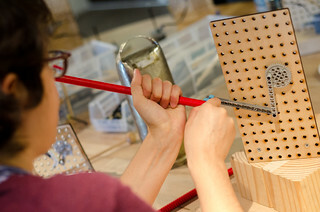 We were glad to know that our custom-made pegboards support and encourage many ways of building Sound Machines. The Lego pen holder that Sebastian designed while we were developing Lego Art machines worked great to hold something skinny like a mallet, but in this activity we've noticed that most of the instruments had a thick handle so they wouldn’t fit. This makes us think about to design and 3D print larger pen holders. On a related note, the pre-drilled holes that Nicole had made on the music instruments were helpful for people to attach the instrument to the mechanism. Having several holes on one instrument is better because it gives people options on how to attach the instrument to make it sound differently. 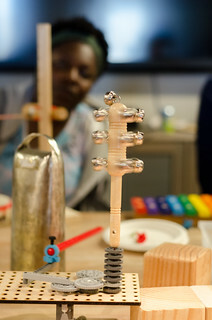 Since these music instruments and noise makers are usually in weird shapes and do not go along with Lego system, figuring out a good way to attach them would be nice so people do not have to struggle there. Some people mentioned that having this Lego part was also really good because it suddenly expanded the possibility of machine construction. By having this piece, it changes how things move on the same mechanism, and your Sound Machine becomes 3 dimensional! My favorite Sound Machine from that night is this one. Usually people try to control only the mallet to hit different notes on the chime, and most of the time it doesn't work well. 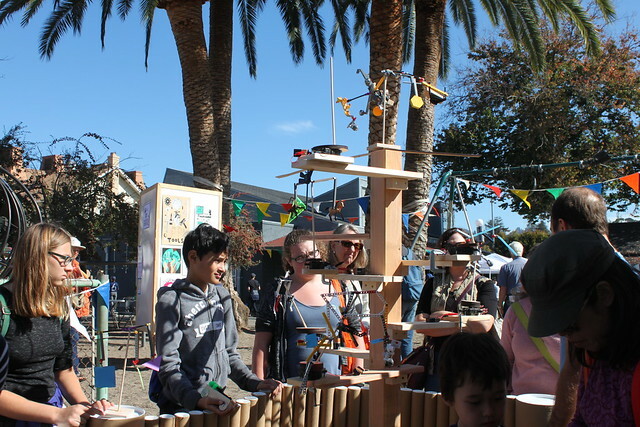 But here, this group successfully controlled the mallet AND the chime so the mallet can hit a different note each time while the chime moves back and forth. It was pretty amazing to see how constantly it plays the three different notes! Another difference that I thought is that Sound Machine gives immediate feedback on people's creation. If you see your music instrument didn't sound or your motor is spinning for nothing, you know immediately something is not working and try to fix it. This cycle of testing, getting a result, and fixing seems to be a lot shorter than that of cardboard linkages. These are the things that we would like to keep thinking about while further developing linkage activities. One last reflection from that night was that we witnessed a marriage proposal in the learning studio for the first time ever! Sam, who works at the Exploratorium, proposed Ray who was participating in the tinkering meet-up! hooray! 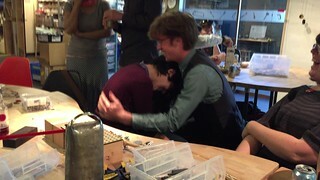 There was love and laughter, and the room was filled with charming sounds of Lego linkages. It was a very memorable tinkering session. Recently, we got to try out a couple of new electronics kits called Lectrify. The parts can be snapped off and embedded directly into your project. It was fun to experiment with this kit and I’d like to share some of the thoughts that I had while playing with it. 2) techniques for making LEDs sewable - curl up both of the “legs” or leads with a needle nose pliers to make them sewable. 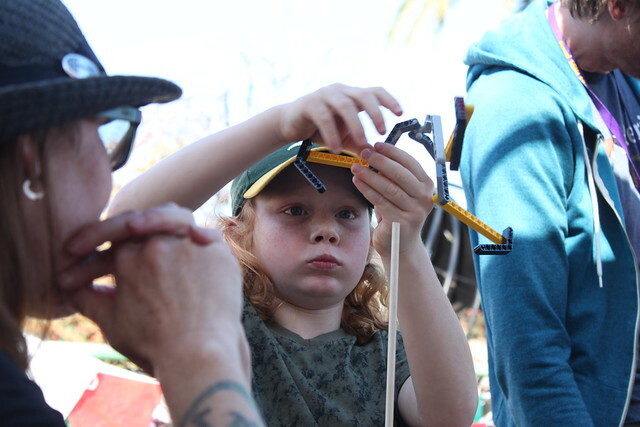 3) tools - We also teach people how to use the pliers, since it’s often their first time using that kind of tool. 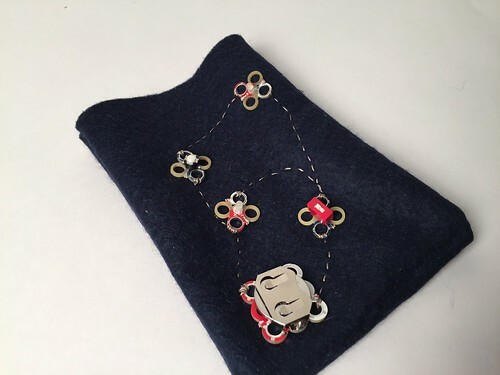 With Lectrify, you can skip these steps and jump right into sewing circuits. I made a bag for my phone with the two LEDs in parallel and two different kind of switches in series (a momentary switch and on/off switch). I was kind of surprised at how quickly the components turned into a sewn circuit project, which is what I liked most about this kit. Our Circuit Boards are fun to play with and allow you to explore electricity, but they can't be embedded in a project (they weren’t designed for that). With Lectrify, once you explore a circuit and understand how it works, you can take the components and use them for your project. I've seen lots of circuit kits but not so many of them have this kind of embeddability that could be used in broad applications, for example this could be used in sewn circuits, paper circuits, scribbling machines, bristlebots, Lego circuits, etc. The cost isn’t as cheap as raw components, but it’s not that expensive (as of today, it is $5 on Amazon). With its compact size, we were thinking it might be a nice addition to our vending machine in the Tinkering Studio! Here is another project that I did with Lectrify. I made a vibrating Lego machine with a pager motor, a battery, and on/off switch. 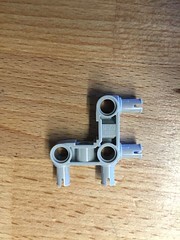 The tiny loops under each component are actually designed to fit well with Lego blocks. Since we’ve been messing around with Lego recently, it was natural to try to create a Lego project with Lectrify. Then I remembered that we had a special conductive tape that our friend Rachel Hellenga brought a while ago. This tape has holes that align with Lego studs! Lectrify kit doesn't come with alligator clips or wires, but that actually gives us opportunity to think about what we can use to connect these components. Copper tape, pipe cleaners, tin foil, paper clips, etc., just look around your house to find what you can use to conduct electricity! Adding a motor to Lego naturally encourages iterations as you see how the machine moves around. It's also great to add a potentiometer to adjust the motion. One thing I have to say though, I actually had a hard time trying to fit the components onto Lego. Although their website says that they fit well with Lego, it was not so easy to do that. I eventually used a hammer(!) to make them fit. Overall, it was fun to build circuit projects with Lectrify. The motor, lights, switches, potentiometer, and battery work well as a starter kit. I wonder if they’re planning to expand the range of components to add more variety to the circuits. If so, we look forward to playing with those too! Paper Circuits with Magazine Collages! 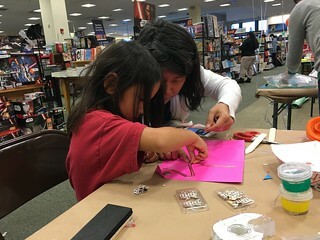 Last weekend, the Tinkering Studio participated in Barnes & Nobles Mini MakerFaire. 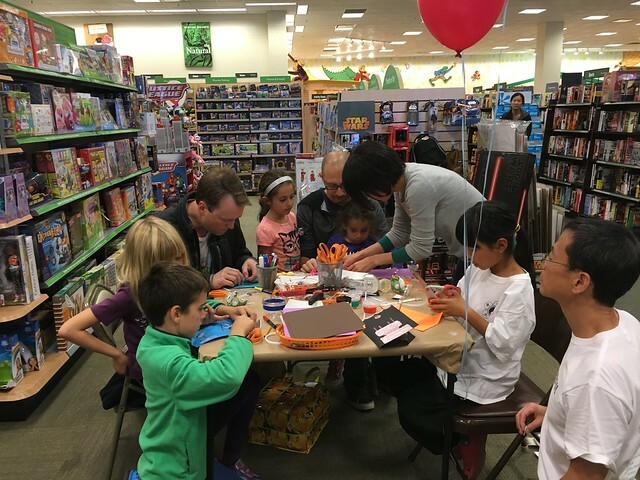 The event was held in nationwide local Barnes & Nobles stores, and we joined the one at the El Cerrito store. 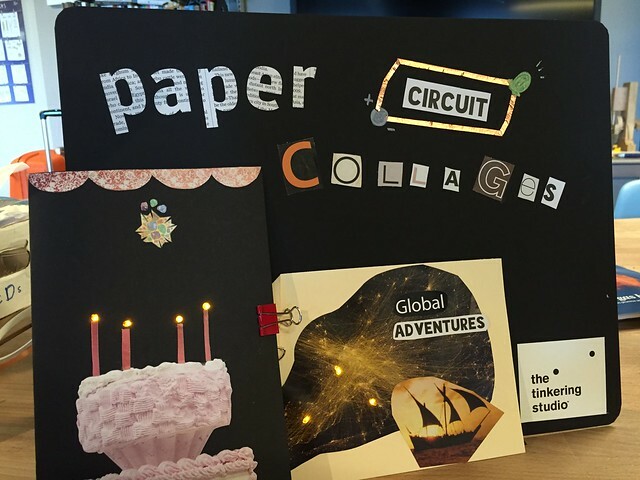 Since we love iterating on existing activities to find a new way of doing it, we took this opportunity to try something new – Paper Circuits with magazine collages! 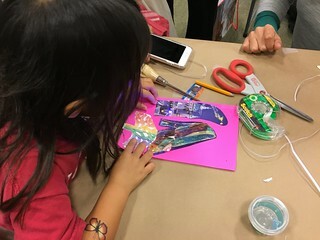 We brought paper circuit materials with tons of magazines so that people can create Paper Circuits along with the images and words that they cut out from magazines as a means of personal expression. 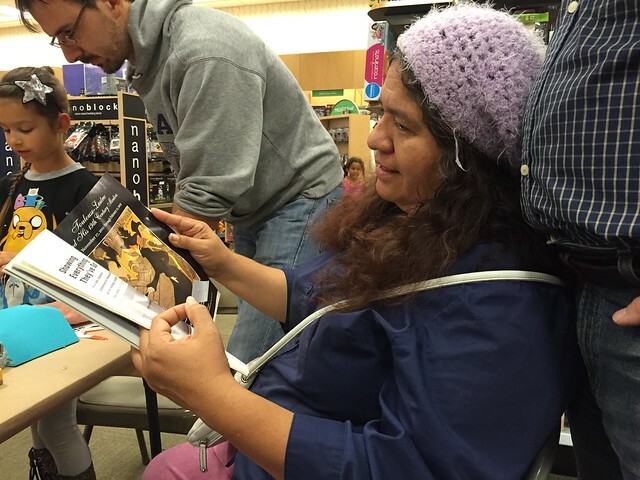 The space was a little bit tight (we were having two tables in the middle of the bookstore! ), but it actually felt ok to work with others with such a proximity as it allowed interactions among participants and cross pollination of ideas easily. Making eyes light up was people’s favorite way to get started. Due to the space, we could serve only 4 or 5 people at once, but while people were waiting for a seat, they spent their time browsing magazines to pick and cut out images or words that they want to use for their paper circuits. By the time a seat becomes available, they usually had a couple of cutout collages in hands and had some idea of what they want to create with circuits. For example, there was a girl bringing a cutout image of gift boxes and saying “I want to light up here, here, and here!” Like her, a lot of people were already having ideas for their paper circuits when they sat at the table because they already had clipped out images while waiting for a seat and had been looking at those light up cards that other people made. This felt a bit different from our usual paper circuits activity. In our paper circuits activity, people usually try building a simple circuit first, then from there they either continue exploring to build more complex circuits or adding decorations to the circuits. 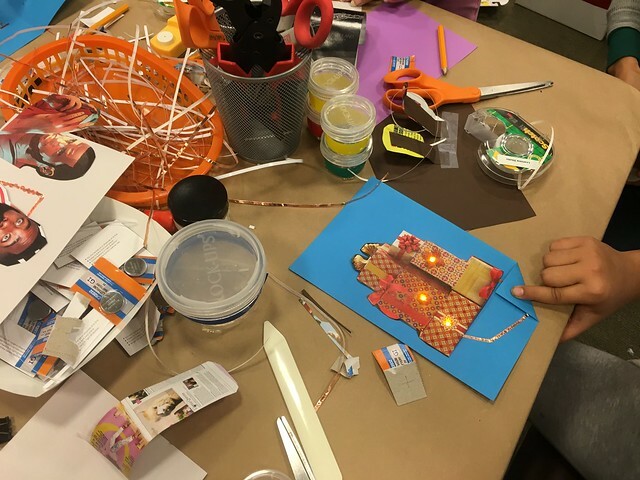 In that process, people don’t necessarily have an idea what they are going to create (or decorate) on the card, the ideas are often emerging as they build the circuits. But I often hear people saying “hm.. what am I going to make? ?” “but I can’t draw!” “I’m not artistic.” Or, on the other hand, I also see people spend really long time decorating their card with intricate cuts using x-acto knife and sophisticated drawings. Using cutout images for paper circuits seemed to be helping get people started with ideas and plans for their creations and have them focus more on building circuits. We noticed that people spent less time on decorating or coloring their cards and were more motivated to build successful circuits to accomplish their ideas with the cutout images. 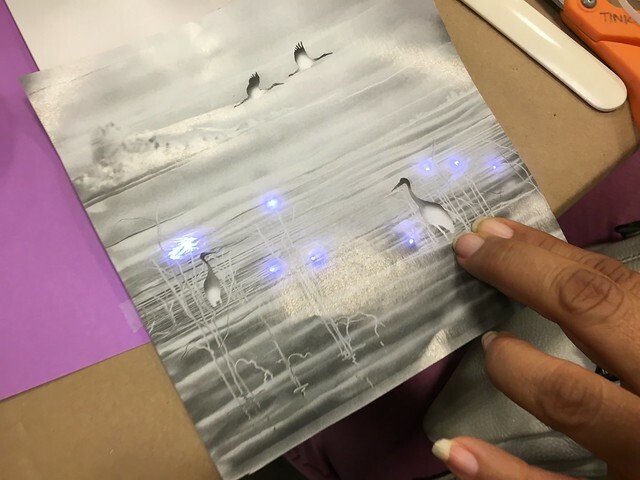 Zen-like image with black and while cranes with 8 white LEDs! 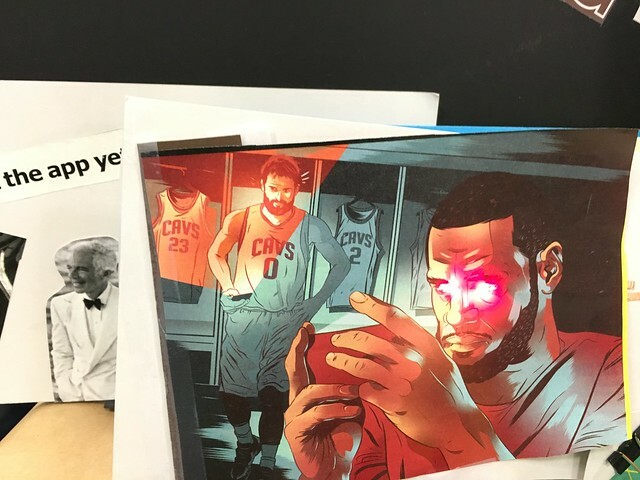 Eyebeaming LeBron James made by Ryan. This is a great simple example because the image is not completely glued down, so you can flip the image and see the circuit below. 6 year old girl building a holiday card with her mom. Over all, we had a great day reaching out to the local community in El Cerrito. 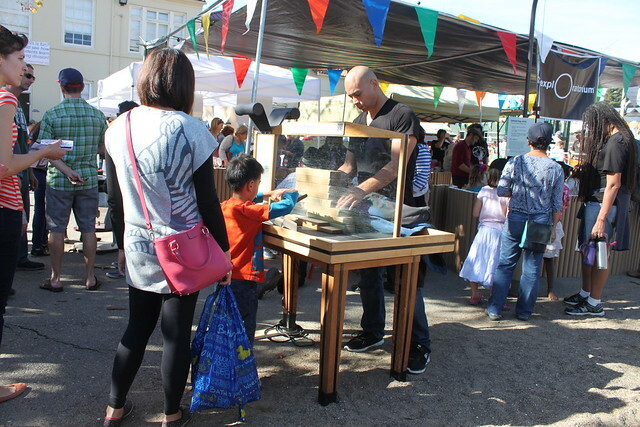 I was a little bit surprised that a lot of people didn’t know about the Exploratorium, so it was actually good to meeting and connecting with those people who hadn’t been to the museum before and found us as a place that they would like to visit soon. 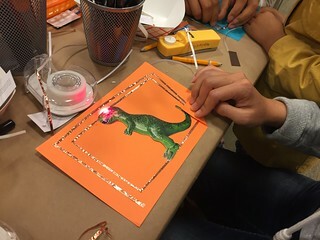 Now that holiday season is coming up, making light up cards with paper circuits will be a great activity to try in the class, home, and the museum. 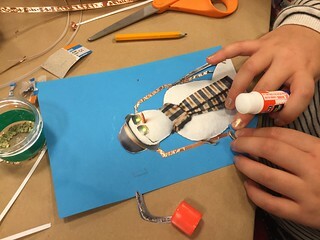 Using magazine cutouts for creating paper circuit cards is something we would like to try more in the Tinkering Studio. We’ll continue iterating on this activity and post more findings as we try it out!